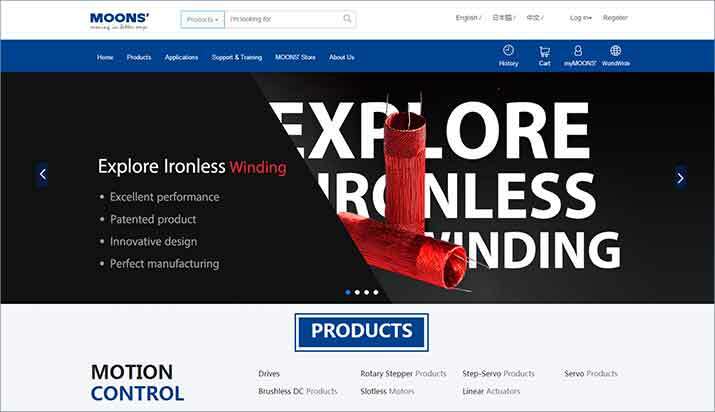 MOONS’ global E-commerce platform (English Website: www.moonsindustries.com ) was officially put into operation in June after more than one-month trial service since its launch at the end of April. MOONS’ E-commerce underlines the product focus on “high-performance, high-quality and distinctive”, by integrating the most competitive standard products of its business units and subsidiaries. Together with professional service in products search, application solutions, online orders and technical support, MOONS’ E-commerce ensures instant one-stop service for global customers. Product-oriented is a principle and MOONS’ E-commerce promotes digital precision marketing through various online channels such as search engines, social media and EDM. O2O sales resources will bring a constant wave of new traffics, orders and potential customers to MOONS’ subsidiaries and partners, facilitating the rapid expansion of both mature and emerging markets. MOONS’ E-commerce will initially be based in Shanghai and establish a global sales and service network by English Platform. The trial operation over the past 90 days has witnessed the online sales of core products such as stepper motors, drivers, etc. The Japanese & Chinese site for PC and Mobile will gradually go live by the end of Q4, 2017. MOONS’ E-commerce also plans to build overseas warehouses in appropriate areas to localize the operation with enhanced service in efficiency and quality. Based on the business model of global purchasing and selling, MOONS’ is committed to building the platform into a worldwide ecommerce leader for motion control and intelligent lighting products.